Last week, I had the great pleasure of assisting Marti Jeffers during her Callaway Gardens and Warm Springs workshop. The area is wonderfully rich in photographic possibilities—from landscape through macro to vintage architecture—and it was inspiring to work with all of the participants. Photographed in the Cecil B. Day Butterfly Center, I was struck by the peaceful quality of this intimate scene. I really like the contrast of colour between the water and the petal, also how the ripples of water are reciprocated with the petals veins. Thank you, Alan. I appreciate your visits and feedback! A wonderful picture of the beauty of nature. I wish i could express my thoughts, so i can only tell you, that i like it very much. I’m delighted you enjoy this image, Thore! Thank you. To me, this is a very touching metaphor. 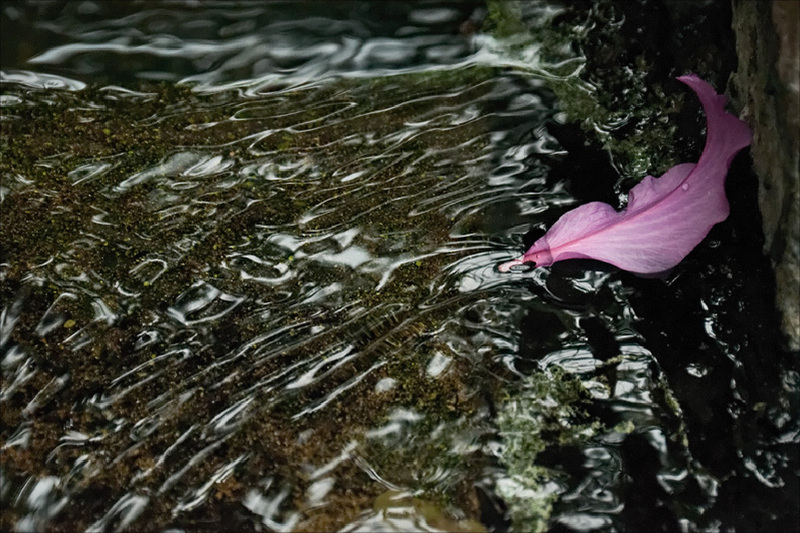 Letting a so little and fragile loved one go with the stream… that’s how life goes. Very nice, April!